The following is a list of agency and community-wide efforts to impact homelessness or those at risk of homelessness that were organized by the coalition and/or reported at Denton County Homeless Coalition meetings. There are so many positive things happening around the community benefiting the efforts to end homelessness. Any event or item is not included in this review was not intentional. If you would like to see a topic added to this report, please contact us. DCHC Steering Committee was restructured to have more capacity for growth and be more inclusive of sectors. Mayor’s Task Force for Housing the Homeless and Report was released to the public. The City of Denton and United Way agree to jointly fund a Homeless Coordinator position. The position was filled in 2016. 2015 Point-In-Time (PIT) Count was completed in January 2015 providing a snapshot of homelessness in Denton County. 100K Homes Pilot- The placement of 3-5 chronically homeless in housing. 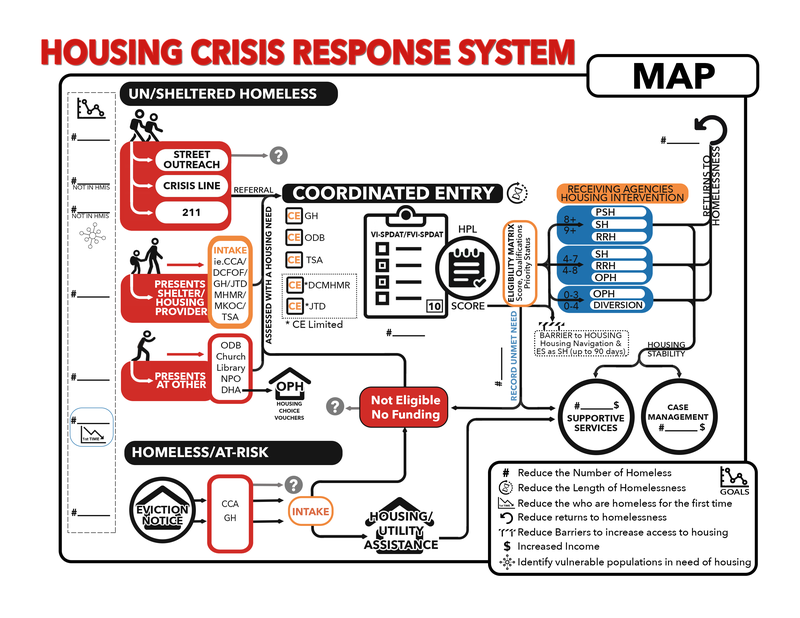 Using data collection from a count in November 2014 that survey the chronically homeless to determine who was most at risk of dying on the street a piloting program was developed using the housing first model. Pilot data and results could inform new practices in housing. If proven successful, it could be scaled to house even more. HUD Emergency Solutions Grant funding in 2015 was $625,000 (2104-15) in Denton County. Funds supported Street Outreach, Homelessness Prevention, Rapid Rehousing and Emergency Shelter services. Veteran Standown was held in October of 2015 – The event offered distribution of supplies and provided services to homeless veterans. Denton Housing Authority sets preferences for Section 8 Vouchers that included veterans and homeless. In the Media the Denton Record Chronicle featured many articles and multiple editorials in 2015 related to homelessness. The Wheeler House opened in July of 2015. The center brings more transitional housing to the City of Denton and addition of more health care options in downtown. Street Outreach Barriers Report was issued. Report highlighted gaps and identified resources needed especially in areas like Lewisville. Diversion Training comes to Denton. Diversion training provided tools for case managers to seek out alternative options for those looking for shelter in an attempt to divert them becoming homeless. A planning grant was awarded by Texas Homeless Network. The grant paid a consultant to generate a report to help identify what kinds of housing Denton needs to prioritize. The report is currently in use by the housing workgroup of the Behavioral Health Leadership Team. Denton CAN/CATT (Coordinated Access) – This program is in the process of testing intake forms and HMIS data as a pilot for a front door or centralized entry point system that would tracking available resources and help the homeless and those at risk of homelessness access services. AbleDisAbled group formed. This is a Peer-to-Peer network for the homeless. It meets weekly at Denton Community Health Clinic and provides peer support to participants. United Way of Denton County’s sponsored Denton County Citizen’s Council on Mental Health and the Behavioral Health Leadership Team. This initiative is investing in the collective impact model. The team’s work is bringing much needed exposure to the issue of comprehensive mental health for every person, which directly impacts those working with the chronically homeless including veterans. For example, one group is currently drafting a pilot project that would divert those exiting jails to mental health and other supportive services to prevent homelessness and jail recidivism. The Mayor’s Day of Concern for the Hungry on April 21, 2015 generated the largest collection of food yet raising 26,609 pounds and receiving financial contributions that benefited several agencies. The event expanded to reach more cities in Denton County and increased exposure to the issue of hunger. The Denton Hunger Coalition coordinated a monthly Mobile Pantry that continues to provide a much needed food distribution point to those in need. This event has the support of many volunteers. It also offers a quarterly community services event. Denton Housing Authority received approval by State and City for 320 Unit Affordable Housing Tax Credit Development. This development will increase the number of below market rent housing, and is specifically offering more units for Section 8 voucher. Location will impact some homeless sheltering in the currently undeveloped property. Breaking ground 2017. Journey to Dream increased awareness of Kyle’s Place, a shelter for unaccompanied youth that is still in development. Organization took the lead on the first ever Youth Count. United Way has hired the Homeless Coordinator who will start Feb. 8, 2016 and will oversee a collective impact strategy for the community in efforts to significantly reduce homeless in Denton County. Questions: How can DCHC collaborate with those efforts? How can DCHC define what will be successful outcomes? The report tools are available for the Denton County Homeless Coalition to adopt and will inform its planning for this year and beyond. Questions: How does DCHC lead the community-wide efforts?How does DCHC use the resources developed by the task force like Housing System Map, Housing Levels Tool, and the Housing Inventory to prioritize and plan? A task force was formed. The need for a shelter and how to best support the efforts to increase resources in all other areas of the county is on the DCHC list for long-term efforts but the short-term focus is to obtain specific resources in one area of the county. Resources identified include a refrigerator for storing meds, mail service, storage for personal items, transportation, and cell phones. Additional discussions might look at a mobile response team and/or more support for the existing Street Outreach Team. Questions: How does DCHC help all cities in the county have resources needed to serve the homeless in their community? The specialized needs of homeless youth were discussed. Strategies will be considered once the data form the homeless youth count is collected and disseminated. Ideas for immediate resources included: lockers; showers; safe spaces to do homework and rest. The shelter will soon come online with the goal of being open daily year-round. Questions: How can DCHC to support the new shelter? What gaps does MKOC fill and where will it fit in the current system? Since this idea originally centered on developing a program to build relationships with landlords, members also requested this be an outcome of homeless coordinator position. Questions: Can landlords be encouraged to help reduce some common barriers to housing? Is there educational resources available to landlords to help them identify a tenant who is at risk of losing housing so the landlord will know where to refer the tenant to services? How can we increase the number of rental units below market rate rent for low income earners and in other cases have an adequate supply of units below FMR where federal funds can be used. Giving Hope, Inc. is planning a Landlord Forum for March 31, 2016. DCHC currently operates as a place for active participants to share knowledge and information. The next level is to encourage action for a broader public. Questions: Does DCHC want to develop position statements on certain topics where it would like to encourage others to take specific action on an issue? With the increase in awareness it is also recommended that DCHC develop a media contact list to have available a short list of contacts for regional media outlets to contact for related press. Continuing advocacy efforts are vital. Giving Hope, Inc is hosting a State of the Homeless Event that will highlighting 2016 PIT Count results, 100K pilot data and an updated Street Outreach Barriers Report. The event is planned for April 21, 2016. The PIT Count is DCHC’s most well know data tool for understanding the number of homeless and current needs. Data is vital to help inform the community about homelessness and as a tool for improvement and innovation in tools to solve the problem of homelessness. There are current opportunities from local universities to expand data collection efforts to better inform our work. Other events include Open Data Data on March 5, 2016. The event will have a focus on using open data to solve community problems. Homelessness will be a featured community issue. Questions: How can DCHC help other organization identify data that can be “opened” up and encourage the organizations to share that data with the broader public?